New York won four titles in five years from 1996 to 2000, but that may never have happened if it hadn't pulled off an unlikely rally, keyed by a series of fortunate breaks, to win Game 4 of the '96 World Series. Overshadowed by the hoopla surrounding Alex Rodriguez's final game with the Yankees is the fact that the organization has planned—since February—to celebrate the 20th anniversary of its 1996 championship team prior to Saturday afternoon’s game against the Rays. While that squad, which delivered the 23rd title in franchise history and its the first in 18 years, is now remembered for kicking off a stretch of four World Series titles and five pennants during the first six years of manager Joe Torre's tenure in the Bronx, it bears remembering how close that dynasty's first championship came to not happening at all. In particular, it's worth harkening back to Game 4 of the 1996 World Series against the Braves, and the unlikely sequence of events that helped New York overcome a six-run deficit—the second-largest comeback in Series history—to win 8–6 in 10 innings and even up the Series at two games apiece. Without that victory, which is famous for Jim Leyritz's game-tying, three-run homer in the eighth inning off Atlanta closer Mark Wohlers, the Yankees would have trailed the Fall Classic three games to one, leaving them no margin for error while having to win games started by future Hall of Famers John Smoltz, Greg Maddux and Tom Glavine, in that order, over the remainder of the Series. Even with New York having just delivered the team's first pennant since 1981, there's no telling what kind of havoc owner George Steinbrenner might have wreaked on Torre, general manager Bob Watson and the roster containing the homegrown core that the team had so uncharacteristically hung onto during its lean years in the early 1990s. The preservation of that core—centerfielder Bernie Williams, shortstop Derek Jeter, starter Andy Pettitte and reliever Mariano Rivera (catcher Jorge Posada wouldn't secure his spot in the majors until 1997)—had its roots in Steinbrenner's 31-month banishment from baseball, starting in the summer of 1990, for paying Bronx gambler Howard Spira $40,000 to dig up dirt on former Yankees star Dave Winfield. During Steinbrenner's absence, general manager Gene Michael ran the team's baseball operations, and while New York fished well below .500 in 1990, '91 and '92, Michael charted a course to success by building around young prospects. Most notably, he chose Jeter with the sixth pick in the '92 draft and stuck with the struggling Williams, while shoring up the team's core by signing free agents like third baseman Wade Boggs, a future Hall of Famer, and making a trade with the Reds for Paul O'Neill that sent homegrown outfielder Roberto Kelly to the Reds. The plan worked, as the Yankees won 88 games in 1993, owned the AL's best record when the '94 players' strike hit in August and used a 26-8 finish to claim the AL's first-ever wild-card berth in '95. After losing a thrilling five-game Division Series to the Mariners, New York parted ways with manager Buck Showalter, shifted Michael into a role as the team's VP and director of scouting in favor of Watson and watched the face of the franchise, first baseman Don Mattingly, retire. Watson hired Torre, who had met with limited success as a manager in the past—"Clueless Joe" bellowed the headline in the New York Daily News—and then remade the roster with a series of moves, none of which were as splashy as the off-season additions the franchise had and would soon be known for. Watson swung a five-player deal with the Mariners that brought in Tino Martinez to replace Mattingly at first base and Jeff Nelson as a key reliever; acquired veteran outfielder Tim Raines from the White Sox; re-signed key free agents in Boggs and David Cone; and supplemented the roster with players who would have important roles, such as second baseman Mariano Duncan and righthander Dwight Gooden. The Yankees started inauspiciously in 1996, winning just 11 of their first 21 games, but they won nine of 10 as April turned to May and moved into first place for good. They finished with 92 victories—the most notable of which was Gooden's May 14 no-hitter against A-Rod and the Mariners—with Williams hitting a team-high 29 homers and Martinez adding 25 and O'Neill 19 to go with a .302 average. On the mound Pettitte went 21-8 and Rivera offered brilliant set-up work, helping that pair finish second and third, respectively, in the AL Cy Young voting. Then there was Jeter. He wasn't even supposed to be the team's starting shortstop, but incumbent Tony Fernandez fractured his right elbow during spring training, costing him the season. Watson nearly dealt Rivera to the Mariners to acquire Felix Fermin as a fill-in, but instead the 21-year-old Jeter won the job and proceeded to put together the first excellent season of his Hall of Fame career, hitting .314/.370/.430 en route to AL Rookie of the Year honors. After winning the AL East by four games over Baltimore, New York rolled over the Rangers in a four-game Division Series, then beat the Orioles in a five-game ALCS, aided by 12-year-old fan Jeffrey Maier snagging Jeter's game-tying home run in the eighth inning of the opener. In the World Series, the Yankees faced the defending champion Braves, who under Bobby Cox had beaten the Indians in the previous year's World Series for the franchise's first championship since 1957. Atlanta quickly took control of the Series by winning the first two games at Yankee Stadium. After the opener was delayed a day by rain (removing the first travel day from the schedule), the Braves trounced the Yankees 12-0 in Game 1 behind 19-year-old rookie Andruw Jones' two homers, and then shut them out in Game 2, as Maddux and Wohlers combined for a seven-hit shutout and a 4-0 win. The series shifted to Atlanta's Fulton County Stadium, where New York stayed perfect on the road during the postseason with a 5-2 win in Game 3 behind six strong innings from Cone and a two-run homer by Williams. Played on Oct. 23, Game 4 pitted the Braves' Denny Neagle against the Yankees' Kenny Rogers, both southpaws. As he had done in Game 3 against Glavine, Torre sat lefties Boggs, Martinez and O'Neill in favor of righties Cecil Fielder and Charlie Hayes and lefty Darryl Strawberry, respectively. Rogers, another of Watson's free agent signings, had gone 12-8 with a 4.68 ERA (good for a 107 ERA+ in those high-offense days), but he had been dreadful in the postseason, allowing 14 of 29 batters to reach base and surrendering six runs. Though it wasn't widely known at the time, Rogers was pitching through both a partial muscle tear in his shoulder as well as a bone spur in his elbow, the latter of which would require surgery. Rogers laid another egg in Game 4. After a scoreless first, he allowed four second-inning runs, with Fred McGriff's leadoff homer, Jeff Blauser's bunt single and Marquis Grissom's two-run double plating them. When he started the third by yielding back-to-back singles to Chipper Jones and McGriff, he got the hook in favor of righty Brian Boehringer. Javy Lopez immediately produced a sacrifice fly that scored Jones, and Atlanta then expanded its lead to 6-0 in the fifth against David Weathers, when Andruw doubled home Chipper. At that point, New York's chance of winning was just 2%, according to Win Probability Added. In the sixth inning, the Yankees caught the first of several breaks that keyed their comeback. Leading off the inning, Jeter hit a pop foul into shallow rightfield. Jermaine Dye might have caught it, but he grazed rightfield ump Tim Welke while pursuing the ball, which landed between Dye, McGriff and second baseman Mark Lemke. "Welke was the only one in position to catch that ball," said Fox play-by-play man Joe Buck. Jeter took advantage of the reprieve by dumping a single into right. After Williams walked, Fielder hit a drive to rightfield that Dye misplayed into a two-run, two-base error, yet another stroke of fortune. Two pitches later, Hayes drove in Fielder with an RBI single, cutting the lead to 6-3 and ending Neagle's night. New York loaded the bases later in the inning, still with nobody out, but righty Mike Bielicki came on to strike out the side, whiffing Duncan and pinch-hitters O'Neill (batting for catcher Joe Girardi) and Martinez (batting for Weathers) to escape the jam. Both batters exited the game, with a new battery of Leyritz and Nelson taking over. The 6-3 score carried into the top of the eighth, when Cox brought in Wohlers, who had saved 39 games in 44 save opportunities during the regular season and then gone 5-for-5 in the first two rounds of the postseason without allowing a run in 7 1/3 innings. The inning began with Hayes' swinging bunt down the third base line, which chopped, hit the chalk and then improbably hugged the line in fair territory before dying at Chipper Jones's feet. Strawberry laced a clean single to leftfield, bringing the tying run to the plate in the person of Duncan. He hit what should have been a double play grounder to shortstop Rafael Belliard, a defensive specialist who entered the game in the top of the seventh. Instead, the ball kicked off the heel of Belliard's glove, and he got only the forceout at second. That brought up Leyritz. The 32-year-old backup catcher had hit a memorable home run the previous October, a 15th-inning walk-off against Seattle in ALDS Game 2, against soft-throwing Tim Belcher. This time, facing the heat-seeking Wohlers, Leyritz fouled off a couple of high-90s fastballs and battled his way to a 2-2 count before clubbing a hanging slider over the leftfield fence—well beyond the reach of the wall-scaling Andruw Jones—for a game-tying, three-run shot. "I don't think I've ever seen Mark Wohlers throw this many sliders in his life," said Fox's Tim McCarver on the broadcast, disbelieving that Wohlers could get beaten with his third-best pitch rather than a fastball that could touch triple digits, or a splitter. Wohlers remained in the game and nearly allowed the go-ahead run in the ninth when the Yankees loaded the bases on a string of two-out singles by Fielder, Hayes and Strawberry—a trio that accounted for seven of New York's 12 hits that night—before getting Duncan to line out to Dye in right. In the bottom of the ninth, Atlanta put two on with one out against Rivera, who was working his second inning. He gave way to lefty specialist Graeme Lloyd, who had been cuffed for a 17.47 ERA in 5 2/3 regular season innings after being acquired from the Brewers on Aug. 23 but had gained Torre's trust by retiring 11 out of 12 batters in six postseason appearances to that point; Lloyd got McGriff to ground into an inning-ending 6-4-3 double play. That sent the game into extra innings. Steve Avery, the 1991 NLCS MVP who was once considered as promising as any of the Braves' young pitching prospects, had now been relegated to a relief role. He retired the first two batters of the 10th but then ran into trouble by walking Raines. Jeter followed with infield single, prompting Cox to intentionally walk the switch-hitting Williams, New York's best all-around hitter, even though third base was the only spot open. Torre called upon Boggs, the last position player on his bench, to pinch-hit for Andy Fox, who had pinch-run for Fielder in the ninth. The 38-year-old Boggs had hit a modest .311/.389/.389 for a 98 OPS+ that year, but in addition to being a five-time batting champion, he was a six-time on-base leader with a career OBP of .422 to that point—making him the perfect man for the spot even with his platoon disadvantage. Boggs dug out of a 1-2 hole to work a six-pitch walk, scoring Raines with the go-ahead run. Jeter scored an insurance run when Hayes, hitting against reliever Brad Clontz, hit a first-pitch bloop that first baseman Ryan Klesko lost in the lights and dropped for an error, running the score to 8-6. Lloyd, who had hit for himself in the top of the 10th, went back out for the bottom half and struck out the lefty-swinging Klesko before yielding to closer John Wetteland. Andruw Jones greeted him with a single, before Dye and Terry Pendleton flied out to the warning track in left. While securing the final out, Raines tripped and fell but held on to the ball, the last of a ridiculously improbable series of breaks that helped the Yankees to a stunning win that evened the Series. The breaks kept coming the next night. The only run of New York's 1-0 win over the otherwise dominant Smoltz scored when Marquis Grissom, who won his fourth straight Gold Glove that year, dropped a fly ball from Hayes, who was brought home two batters later on Fielder's double. Two days later, back in the Bronx, the Yankees clinched the title with a 3-2 win. All three runs scored against Maddux came in the third inning, the only one of 15 2/3 frames in which they dented the plate against the reigning four-time Cy Young winner in the entire Series. After the final out, Boggs overcame his fear of horses for a ride on one of the NYPD's finest equines, Torre became the toast of the town and the city feted the champions with a parade attended by approximately three million people. While Rivera's Game 4 blown save helped cost the Yankees the 1997 Division Series against Cleveland, such celebrations became an October ritual in New York. 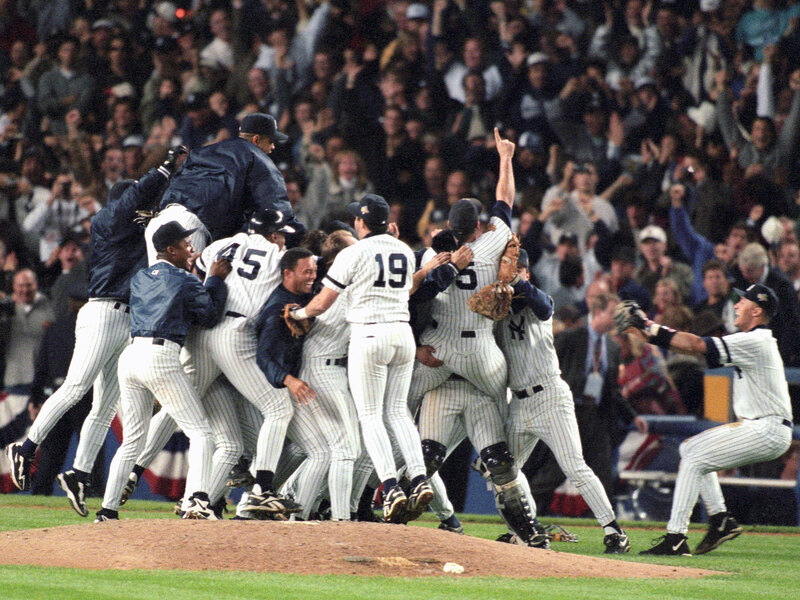 The Yankees won a record 125 games, postseason included, en route to the 1998 title, then went 11-1 in the postseason on their way to the '99 championship before beating the Mets in the Subway Series in 2000 to become the first team in 26 years and the last in baseball history to win three straight titles. Perhaps the dynasty would have still unfolded more or less as it did if Dye had caught Jeter’s foul pop, or if Belliard had turned that double play, or if Wohlers gone to the fastball against Leyritz, any one of a number of other things that broke New York's way on that fateful October night in Georgia. But the Yankees will celebrate that 1996 championship on Saturday thanks in large part to those turns of events. It’s almost enough to make one believe in a team of destiny.